One of the world's top goalkeepers, the 30 year old Slovenian international, Samir Handanovic, has saved his sixth penalty in a row for Inter Milan earlier today vs. FC Dnipro in the UEFA Europa League. This is an amazing feat! 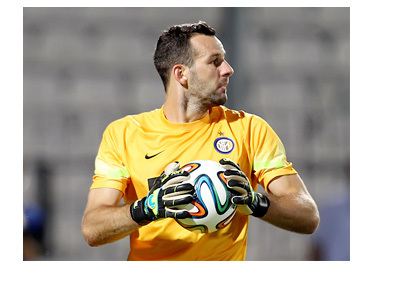 'It's my job to make saves and I try to do it as best I can' - Handanovic said after the game. This is 6 penalties saved in 2014 and more than 20 in his career. Handanovic is an amazing keeper and Inter are lucky to have him. The Nerazzurri have always had legendary goalkeepers. Some of the famous names are Walter Zenga, Gianluca Pagliuca, Angelo Peruzzi, Sebastien Frey, Francesco Toldo and Julio Cesar. Inter also have a very talented 22 year old Francesco Bardi on the books.